Ermina Soler grew up in a tenement in the Brooklyn, N.Y., projects, mired in generational poverty. 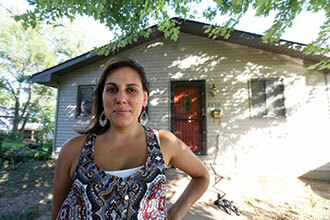 Soler long believed homeownership was out of reach. But a Dupaco Community Credit Union savings program helped the 37-year-old Dubuque woman turn that dream into a reality. Soler the latest successful participant of “Dupaco MoneyMatch—the account that matches your effort.” The Dupaco MoneyMatch is an Individual Development Account (IDA), where the savings of a participant are matched by a dollar-for-dollar grant from the Dupaco R.W. Hoefer Foundation or the Iowa Credit Union Foundation. The savings and matching funds are used to purchase a specific asset, such as a home, starting a small business, paying for education or purchasing a vehicle. Thanks to MoneyMatch, Soler was able to stick with a savings plan for the first time, accumulating the funds she needed to make a down payment on her first house. Systematically saving money from every paycheck and her tax return, Soler eventually accrued $4,000, with another $4,000 matched by the Foundation. On April 17, just one year and two days after enrolling in the program, Soler purchased a three-bedroom ranch in Dubuque, becoming the first homeowner in her immediate family. Now Soler and her three children have more stability, pride and hope for the possibilities and opportunities yet to come. And that’s what Dupaco’s mission is all about—improving its members’ financial lives. Until now, Soler has always lived in rental properties, at times even relying on housing assistance. If she was ever going to truly thrive, she says, she needed to start building equity and assets. And homeownership was the next natural step. Soler first learned about MoneyMatch through her position as Circles Coach for the city of Dubuque. She serves as a source of encouragement for those involved with the Circles Initiative, a national movement that connects volunteers and community leaders to families wanting to make the journey out of poverty. As she learned more about MoneyMatch, she realized that not only would her clients benefit from the program, but she would too. RJ Montes, branch manager at Dupaco’s Pennsylvania Avenue branch, helped Soler with her mortgage loan. Her determination to make her goal a reality so quickly was nothing short of impressive, Montes says. Before her involvement with MoneyMatch, Soler says she felt like she was on a continuous roller coaster with her savings. The program gave her structured savings. She couldn’t easily access the money, and before long the automatic contributions became a natural part of her budget. For that year, she got used to working with a little bit less. But there was another key to Soler’s success: She had chosen the right goal to work toward. There was a purpose behind the savings. Saving for homeownership is just the tip of the iceberg for Soler. She has a working list of needs and wants for her new home, and she plans to establish a new Dupaco savings account for those projects. She also wants to start saving for a family vacation, offering another avenue to show her children how the savings process works and, perhaps more importantly, what it represents. MoneyMatch participants must meet income guidelines and be residents of or purchase assets in the state of Iowa to qualify. Credit union members interested in more information on MoneyMatch may contact Dupaco’s Member Services Department at service@dupaco.com or (563) 557-7600 / 800-373-7600, ext. 206.